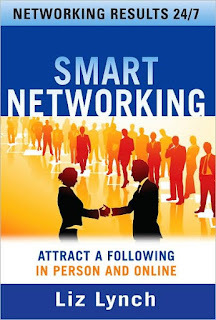 Smart Networking: Attract a Following in Person and Online. Liz Lynch. McGraw-Hill. 208 pages. Networking is confusing. Merely a few short years ago, it was just a matter of handing out and scooping up business cards then following up with a nice note and/or phone call. The proliferation of e-mail provided another way to keep in touch, then blogs, MySpace, Facebook, LinkedIn, Twitter and other Internet applications afforded additional solutions — and challenges. How do you make sense of it all? More importantly, how can you use these tools to effectively connect with colleagues, clients and others? Damned if I know. I blog, am on LinkedIn, Facebook, MySpace and even signed up for Seth Godin's new leadership network, Tribes, but have yet to figure out how to make all these disparate media work cohesively and consistently for me. Right now, in fact, I need it more than ever. Luckily, I have Liz Lynch to learn from! Initially I was a little wary of her new book. After all, the early chapters are devoted to establishing why it's so important to network in the first place. Double duh! Anyone in this age and business climate who is unwilling or unable grasp why it's still not simply what you know, but who you know — and who they know — deserves their infamous and ignominious fate. Yet, Lynch patiently and painstakingly explains all the whys and wherefores in an effort to allay the sundry fears of the averse. This entry-level Networking For Dummies approach didn't really do much for me, though it's unquestionably of value to newbies or other relatively clueless individuals for whom the process may appear daunting or overly icky. So I dutifully plowed through this all-too-familiar territory, read the reasoned arguments for engagement and wondered if we'd be seeing something that would actually justify her use of the word ''smart'' in the title. Eureka! After 164 pages, Lynch finally gets to the money shot: creating an action plan with specific goals and the means to achieve them. There's an excellent single-page form you can complete that will add clarity and help define your ends and means. But it's not a one-size-fits-all solution. Instead, it's a menu of strategies and tactics, so it's not simply plug-and-play, but if you have already embarked upon the fundamentals, you'll be well positioned to proceed. For example, how can you integrate your blog with Facebook and/or LinkedIn? Should you produce an e-book, and if so, do you distribute it by e-mail as text, html or as an attachment or download? Lynch doesn't tell you what to do, but presents options since your needs and goals should determine your course of action. Her website offers readers access to a downloadable version of the plan by using a password included in this book. The site has a number of resources for non-readers, too, and is an extremely useful complement to everything offered herein. For those of us struggling to leverage our knowledge, experience and contacts, the lucid lessons of Liz Lynch may prove to be not just smart, but lucrative, too.